As teams dive into the 2017 NFL offseason, focuses begin to shift toward bettering their overall rosters and pursuing Super Bowl LII in Minneapolis. After the combine, the all important offseason free agency begins, leaving teams and un-signed players the opportunity to negotiate with one another. Here are some of the top free agency names of the 2017 NFL offseason. Although the Pittsburgh Steelers are expected to use the franchise tag on Bell, the electrifying running back would undoubtedly be the biggest name to hit the free agency market this offseason. Past suspensions and injuries aside, when healthy and active, Bell adds a dimension to the Steelers offense that is a rarity across the landscape in today’s NFL. With the franchise tag, Bell will be subject to either a long-term extension once again in 2018, or face testing the free agency market. Playing under the Washington Redskins’ franchise tag designation from the 2016 offseason, Cousins was on a one-year, “prove it” type of deal. In today’s NFL that is proving to be a quarterback-driven league, the Redskins will likely use the franchise tag on Cousins for the second consecutive season if a long-term deal is not agreed upon before free agency. Berry might be one of the most coveted free agents of this 2017 offseason period, as seemingly every team in the NFL is looking for a playmaker at one of the safety positions. Coming off one of the best statistical seasons of his short career thus far, Berry is a locker-room leader who played under Kansas City’s franchise tag in 2016. If the Chiefs and Berry do not come to an agreement on a long-term deal, Berry could have his pick of teams come free agency. Jeffery is most likely to be the prize of the 2017 offseason, as it does not appear the Chicago Bears will be utilizing the franchise tag on the star wide receiver for the 2017 season. Despite his undoubted skill set and statistical feats, Jeffery has faced an injury and suspension riddled 2015 and 2016 seasons, so teams might be hesitant to give the receiver No. 1 money. Ingram rose to the top of the edge rushing categories in the 2016 season, making him one of the more coveted defensive options this upcoming free agency period. Should the Los Angeles Chargers choose to let Ingram test the free agency market, Ingram will find himself commanding 2016 free agent linebacker Olivier Vernon-type money. In the 2015 and 2016 seasons, Ingram started all 32 games, recording 125 tackles, 18.5 sacks and seven forced fumbles. 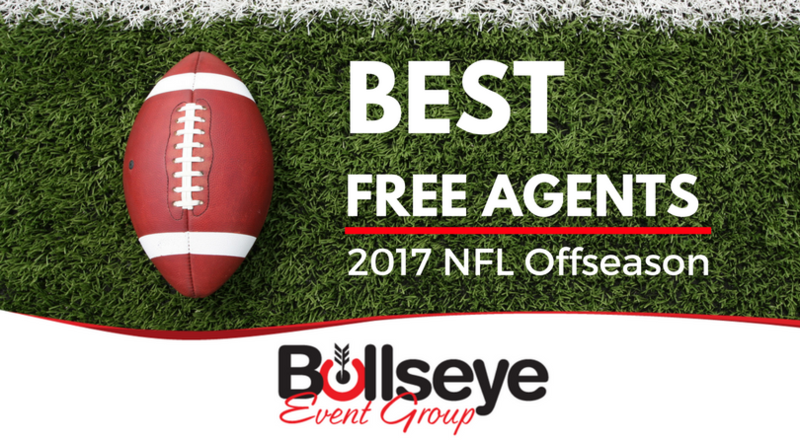 Want to learn more about Bullseye Event Group’s events such as the Players Tailgate at Super Bowl LII in Minneapolis, Gate 6 Hospitality at The Masters and more? Click here.